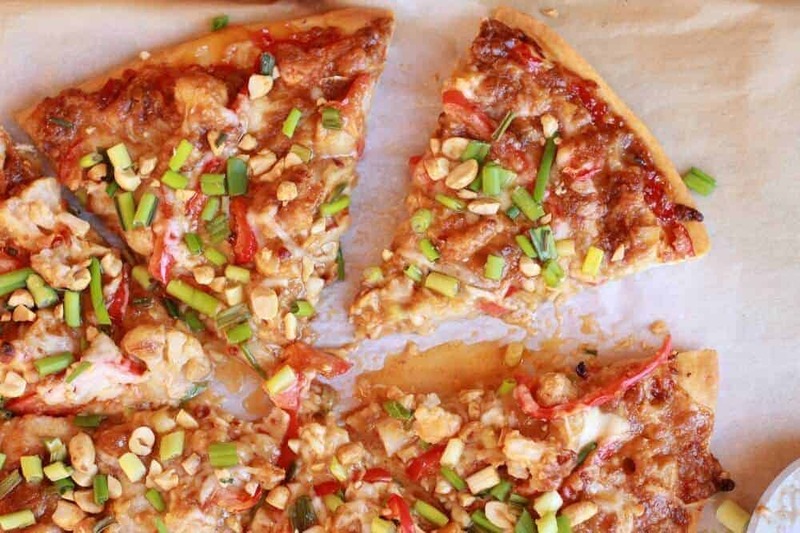 It has nothing to do with this crazy, insanely genius and delicious vegetarian Thai Pizza. We will have to get to that after. Honestly you guys I do not know how I have not told you this yet! It is probably about the weirdest/creepy/funny story. How I have kept it to myself for 4 whole days is beyond me. So, it is Wednesday night. It is about 8:00 and I am pulling dinner out of the oven and calling everyone over (all of my brothers were still in town, the other visitors had left on Tuesday and earlier that day). It was our last family dinner before some us head our separate ways and back to the real world (err, more like just Creighton). My mom walks by the front door on her way to the table (at 8:00 on a Wednesday night) and sees this guy standing at the front door. Mom opens the door and five minutes later Jackie Chan (no, not the real one. That would have been pretty awesome!) is sitting at our dinner table…….eating Smoked Gouda Chicken Enchiladas. You guys, let it be noted that we have no idea who this guy is. At first we did not even know his name. Apparently, after having just graduated in December, he was now driving from Nebraska to LA and his credit card was not working. This meant he could not get a hotel room. So my mom being the kind hearted women that she is invited this total stranger into our house and offered him dinner. How this guy ended up at our house (which is not an easy place to get back to, like at all. Not to mention there are like 20 houses he had to go by to get to ours) is beyond me. We were all a little creeped out and pretty skeptical of his story, but again my mom being who she is, could not let this guy freeze (it was dipping waaay into the negatives). Long story short, there was no way he was gonna sleep in our house. My Dad being umm, smart (or practical) shot that down. So my mom found the guy a cheep hotel home, payed for it and we sent that creep (sorry if I sound insensitive, but it was really weird!) on his way! Welcome to the Gerard household, where there is always and entertaining story! Pretty crazy right? I thought that kind of stuff only happened in movies. So about this pizza. I am not really sure how to express my feeling towards this Thai pizza other than it is pretty freaking amazing, like blow you socks of good! You may think that peanut butter and cheese do not go together, but I promise they do! 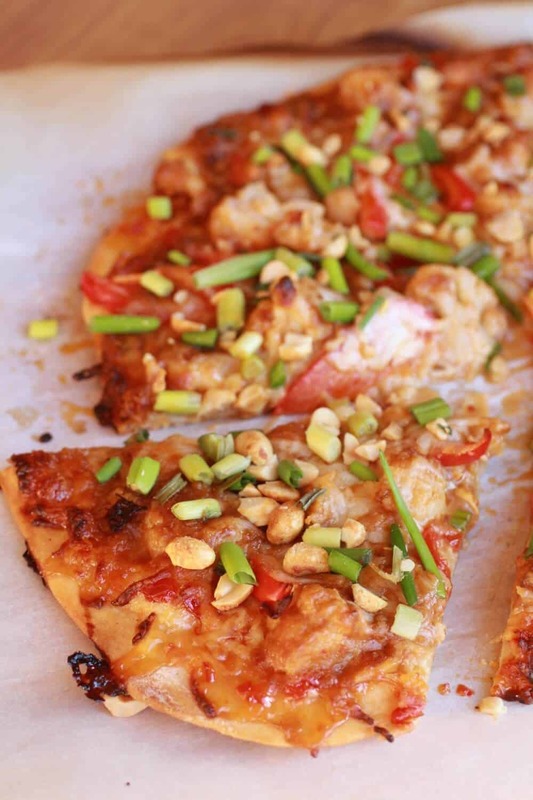 It is slightly sweet, slightly spicy, slightly peanutty and slightly cheesy! It is fresh and light. Just the smells coming from the oven are enough to drool over. Seriously, your first bite will shock you! The flavors are just so good together, so unique and amazing. Only my parents ate this one – too gourmet for the boys, but they thought it was “worthy of starting a restaurant with only this on the menu”, good. 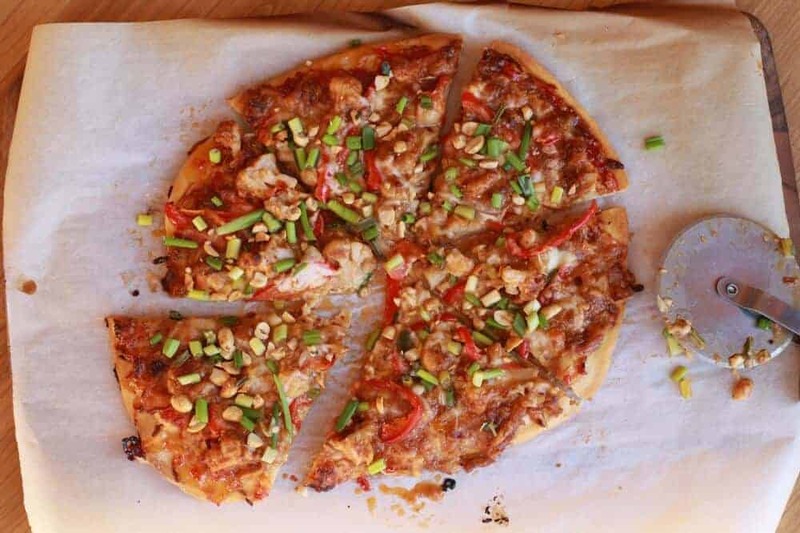 A crazy, insanely genius and delicious vegetarian Thai Pizza. For the Dough: In a large bowl, combine water, yeast and honey. Mix with a spoon, then let sit until foamy, about 10 minutes. Add in 2 1/2 cups flour and olive oil stirring with a spoon until the dough comes together but is still sticky. 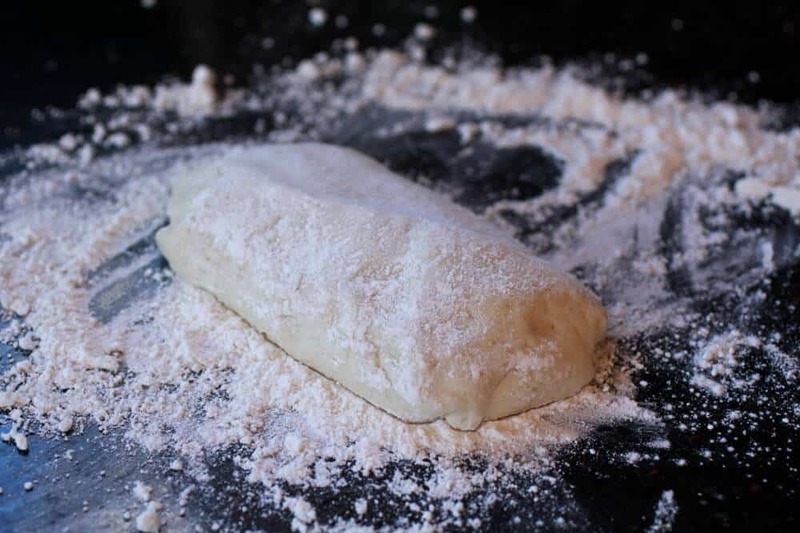 Using your hands, form the dough into a ball and work the additional 1/2 cup flour in to the dough, kneading it on a floured surface for a few minutes. You can also do all the mixing and kneading in your stand mixer with the dough hook attachment. Rub the same bowl with olive oil then place the dough inside, turning to coat. Cover with a towel and place in a warm place to rise for about 1 1/2 hours. To make the Pizza's: Preheat the oven to 375 degrees. Once the pizza dough is ready to go dived the dough in half. Place half the dough aside for another use or freeze for later. With the remaining dough roll/press into two medium size round pizzas (I like to divide my dough in half (again) and make two medium pizza's rather than one large. I find the the pizzas cook better at a smaller size.). They do not have to be perfect! 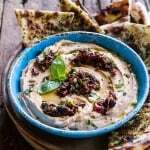 Roll the dough as thin as possible or until you reach your desired thickness. Spread the sweet asian chili sauce all over the pizza dough leaving about a half inch border for the crust. Add the mozzarella cheese. In a large bowl, whisk together the peanut butter through the garlic. Toss the cauliflower in the peanut sauce. Using a fork remove the cauliflower and distribute evenly atop the pizzas. Reserve any remaining sauce for drizzling. Scatter the red peppers on top and drizzle with any remaining peanut sauce. If desired sprinkle with a handful more of mozzarella cheese. Bake at 375 degrees for 30- 35 minutes or until your desired doneness. Sprinkle with green onions and chopped peanuts. Let sit for 5 mintes before cutting. 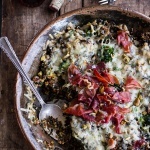 If you like good food, really good food, make this now! Oh my gosh! This looks fantastic. It’s 8:30 in the morning, and I’m drooling. That crisp crust is calling my name! Thanks for sharing at Church Supper. Have a blessed week & come back soon! this is totally on my menu for the month! pioneer woman does one version that is AMMAZING! Thanks for linking up at Show Me Your Plaid Monday’s! OMG – this sounds absolutely amazing. I love thai and pizza, what a genius idea! I can’t wait to try it. Visiting from Back for Seconds. That is one crazy story! And one good looking pizza. 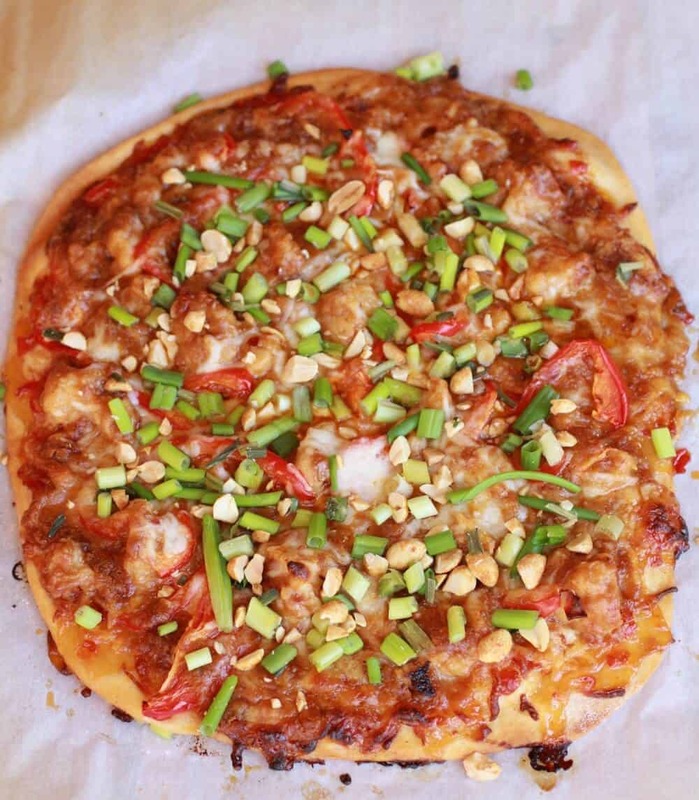 We love Thai food and will definitely have to try this pizza. Yum. Yum. Yum. Yeah, I dont really like chicken on my pizza! I love this minus the spicy ingredients. My husband loves veggie pizza! If you are not into the heat just omit the sambal oelek and replace the hot chili oil with sesame oil. Enjoy! Oh I would for sure love a bite of this right now! Great to see such a new tasty way for my pizzas. Your pizza looks amazing!!!! The topping sounds so good!!!!! While reading this, trying to figure out just how delicious a Thai Pizza can be, I was wondering if you could have made an effort to be more racist. Nothing like good old racism to go with a new recipe. Vanessa, I am really sorry if you feel this post is racist. That was most in no way my intention! I enjoyed your story very much & did not find it to be racist. Your family sounds like much fun & your mother very kind hearted! Wow, this pizza looks great! I love thai food. I will try this one for sure! It is a good one! Thanks for reading! Wow, that looks amazing! Definitely going to try this, thank you! 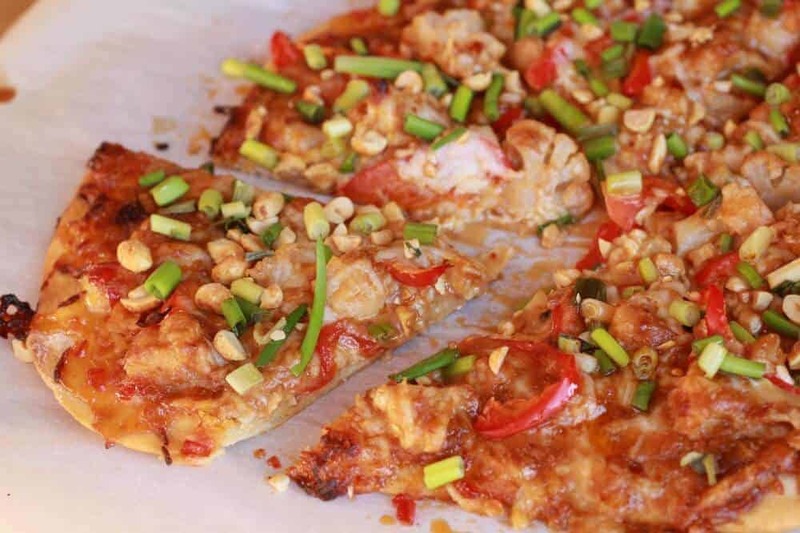 We love Thai Pizza–I like your peanut sauce. It must be delicious. And your mom is an amazing lady! Just wanted to let you know you were featured today on I Freakin’ did it Friday! 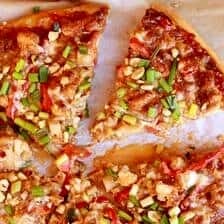 Amazing pizza recipe! Thanks for sharing. I loved your story. Too funny. Wow, this looks amazing! 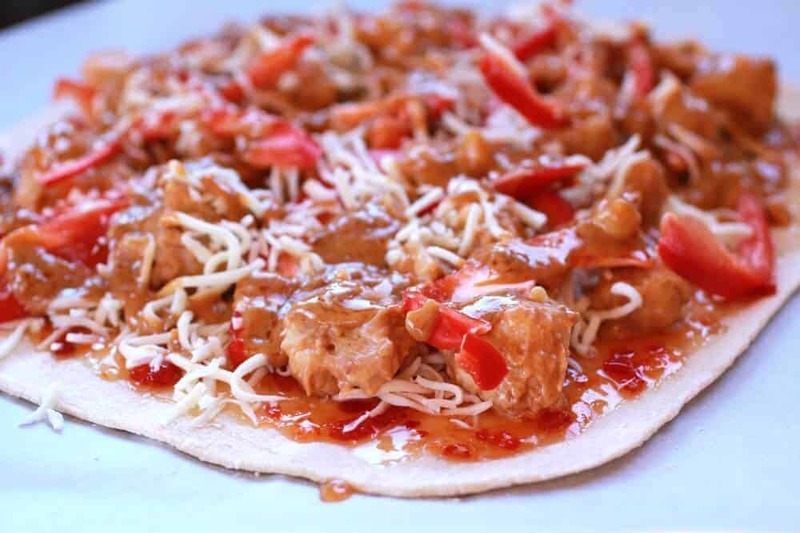 Love Thai food & love pizza so this is perfect… pinned to try this weekend! Found you via Mandy’s Recipe Box, subscribed. Thanks for pinning and subscribing! Always happy to have a new reader! 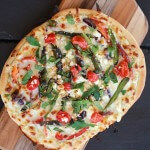 Thanks for finally writing about >Thai Pizza – Half Baked Harvest <Loved it! I was getting ready to make the Thai Pizza, which looks totally amazing, and I’m confused about the directions for the dough. It says 2TBSP divided of honey. It never says divided in what way, how much goes where or when?? Thank you. Hi!! No division of the honey. Sorry about that and I hope you love the pizza! It was to die for!! Best pizza I’ve ever made, seriously, thank you for an amazing recipe! So happy you loved it! THANKS!! Awesome! We just made this pizza and love it. It’s one of the best I ever had. The cauliflower adds a delightful texture. And your peanut sauce recipe is superb. What an amazing pizza. Thank you! I am so happy you love this pizza! Thank you Debbie!